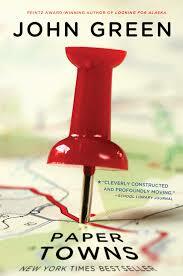 Paper Towns is the third young adult novel by John Green, published on the 16th October 2008 by Dutton Books. It debuted at number 5 on the New York Times bestsellers list for children’s books and was awarded the 2009 Edgar Award for best Young Adult novel. After their all-nighter ends and a new day breaks, Q arrives at school to discover that Margo, always an enigma, has now become a mystery. But Q soon learns that there are clues–and they’re for him. Urged down a disconnected path, the closer he gets, the less Q sees of the girl he thought he knew. Paper towns is yet another book written by John Green which is absolutely remarkable. I found it so easy to get into and even easier to fall in love with. My favorite has to character go to be Margo Roth Spiegelman. I found her so interesting and so intriguing. I found the way Margo describes life is incredible. I also love how she describes Chicago as being the ‘paper town’. “You can see how fake it all is. Its a Paper Town. I mean come on look at it.” However one thing that I really found disappointing about this book was the ending. The book just ends, like I expected more to happen. Despite this I absolutely adored the book and it is defiantly worth reading. OOOOOOOO and there’s gonna be a movie soon….. I CANT WAIT!!! !